Nominated by David Jacoby for “trying to launch Williamsanity at MSG.” Williams scored 38 for the Nets in their victory over their cross-river rivals, the Knicks. He did so with a gleam in his eye that looked like he was avenging a slight that took place LIFETIMES AGO. I think it’s a very useful thought exercise to sometimes just sit down and think about how LeBron James plays basketball like some kind of unholy combination of Magic Johnson, Shawn Kemp, and Khal Drogo.Watch this collection of LeBron’s 10 best plays from just the first half of this season. Sometimes calling what he does “basketball” seems like it’s underselling what he does. Rembert Browne nominates the New York Knicks’ corner-dagger-thrower: “Yes, a byproduct of Linsanity has been the emergence of Steve Novak, but a byproduct of the emergence of Steve Novak has been the emergence of Steve Novak Celebrations. 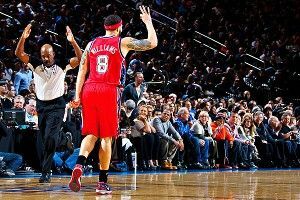 “For three seconds (:23-:26) Novakaine does his own version of the Harlem Shake, known to some as the ‘Milwaukee Stiff,’ after celebrating Jeremy Lin’s buzzer-beater 3 against the Raptors. The way he moves vertically is truly a sight. “After bailing out the Knicks, yet again, with an unbelievably clutch 3-pointer, Stevie runs down the sideline and unleashes the ‘Discount Novacheck’ (:13-:22), a much better version of Aaron Rodgers’ ‘Discount Double Check.’ Again, a marvelous thing to witness. Don’t worry, buddy, I have affixed a Post-it to my computer. If they get knocked out in the second round, we’ll republish this immediately. Rafe Bartholomew wanted this to be no. 1, but I was worried Deron Williams would come shoot long-range 3s all over my soul if I did that.